The £16bn Crossrail scheme to build a railway link through the centre of London may one day be extended as far west as Reading in Berkshire. At present plans for the link extend from Essex in the east, through central London, to Maidenhead in Berkshire. But Rail Minister Tom Harris has announced he is safeguarding additional land between Maidenhead and Reading, about a further 15 miles (24km) west. Work is expected to start in 2010 with trains running from about 2017. The link will provide 24 trains an hour into the heart of London from the east and west, improving rail links to the West End, the City and Docklands. Mr Harris said there were no plans at the moment to extend Crossrail to Reading but by safeguarding the land there would be "the flexibility to be able to extend Crossrail in the future, should there be a business case". 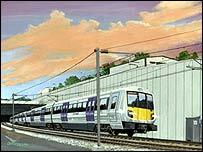 "This safeguarding of the route would also protect the possibility of undertaking electrification works on the route to Reading, even without the extension of Crossrail. "Again, this keeps this option available should a decision be taken to electrify the railway beyond Maidenhead." Prime Minister Gordon Brown gave the go-ahead for Crossrail in October 2007. It will be funded by about £5bn of public money.